Take it from this newbie who just got hip to the unique video-taking trend — these Las Vegas drone videos will blow your mind. These bird’s-eye views of Sin City got this blogger thinking, Wow — do I really live here? Let’s just call it out: Not everyone agrees with how drones operate. They pose safety concerns. Drones are restricted from flying anywhere near planes and airports and must stay below 200 feet. The Strip is a highly trafficked airspace and thus regulated. Also important to note, the National Park Service has banned drones in lands and waters managed by the National Park Service. According to a recent Las Vegas Sun article, the Federal Aviation Administration (FAA) allows hobbyists to fly small drones for fun. Additionally, some Nevada companies have permission to fly drones for photo and video purposes. The FAA is still working on more regulations for commercial use. Fun fact: Nevada is one of six drone test sites used for research before drones are out in airspace for the use of engineering and environmental studies. Drones may be frowned upon by some, but there’s no denying the views they get are spectacular. And since these videos are already released (and we’re all reading this fine and dandy), sit back and allow these gorgeous Vegas views to wow you. Video and top photo courtesy of DRONEfly Inc and Elevated Media Productions. Why it’s cool: This daytime footage has more of a calm, serene feel but you appreciate the Strip views just the same. The pool views look like a refreshing oasis, while CityCenter’s modern exterior looks something from a major metropolitan city. The New York – New York hotel skyline isn’t too shabby, either. You’ll catch a couple of nighttime shots, creating a perfect ending. 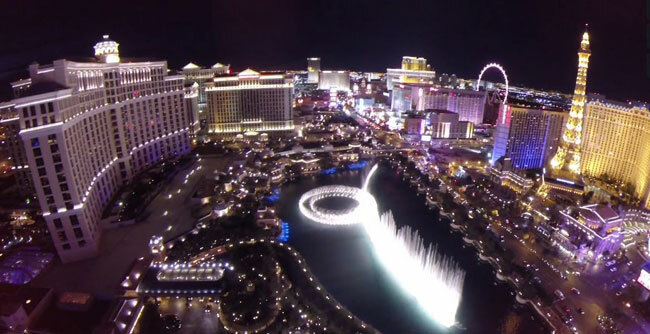 Why it’s cool: While it’s obviously a test flight by someone trying out a drone, there’s some nice overview shots of the Bellagio Fountains. Video courtesy of SKY PHOTOGRAPHY LA. Why it’s cool: There’s a lot of nice Strip shots here with, but it is definitely filmed with the goal of having stock footage / B roll with short segments that could easily be cut into someone’s longer piece. Video courtesy of Isaac Alongi. Why it’s cool: If you’ve never experienced the stunning views of the Southwest, then this is the great way to start. Sometimes we forget about the quiet nature that exists beyond the Strip so this is a beautiful reminder. Both the Grand Canyon and close-up views of Hoover Dam are surreal. We’re also a big fan of time lapse shots and you’ll find those here as well. Now…who’s ready for a hike? Video courtesy of Boss Talk Productions. Why it’s cool: Speaking of hiking, if you want to explore the great outdoors only 20 miles from the Strip, Red Rock Canyon is your best bet. You’ll lots of see red. Radiant, all-natural red. It’s like Mother Nature took a huge paintbrush to color in these bold, fiery formations. We like the fact you can take a day trip here, take a nap and still have time to party all night. Video courtesy of Shawn Kellogg. Why it’s cool: Now that we mentioned partying all night, you better believe we saved the best for last. After watching this drone fly over Electric Daisy Carnival (better known as EDC), you’ll appreciate why this weekend-long event is so dang popular. The light show is bananas. And the fireworks rival the craziest Fourth of July and New Year’s Eve displays. How can you not have the sudden urge to party? The Ferris wheel and swinging ship also add fun touches. If these drone videos got you excited (like Jessie Spano-type of excited), then check out even more fun things to do in Vegas with our handy travel tips guide. Most folks take their Vegas jackpot winnings back home, but my dad decided to stay here instead. That’s how I left Seattle almost 20 years ago. I moved from greenery and rainy days to hot summers, palm trees and desert. As much as I love my hometown, I decided to stick around Vegas. This city just has so much to offer. You don’t even have to be a gambler, bar hopper or an all-night partier. I love Vegas for its awesome vegan-friendly spots, concerts, swanky hotel suites and spas so big, they’re like castles. The pool scene is not too shabby either, which is why I love taking stay-cations. Besides living it up -- Vegas style -- I’m hanging out with my handsome hubby, adorable baby girl, two cats and super-fluffy Shih-Tzu. I’m also a huge fan of '90s music, shows and movies. You can find me on Google+ and Twitter.